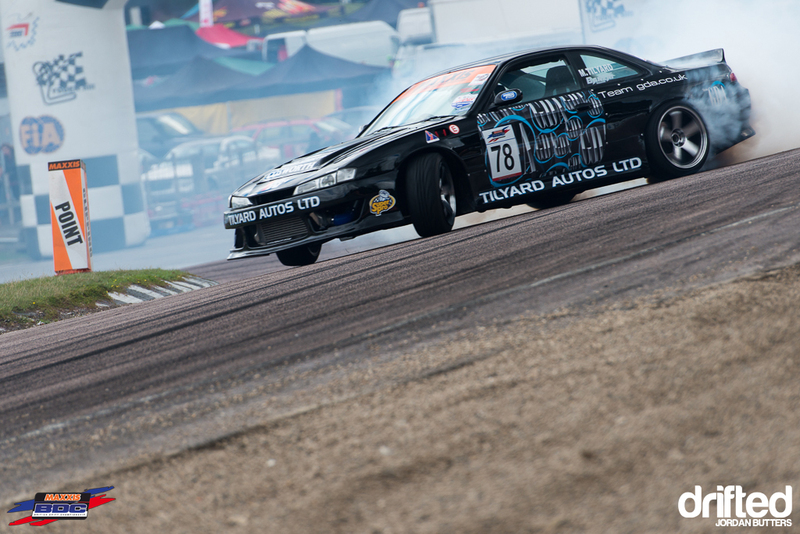 The fourth round of the 2013 Maxxis British Drift Championship saw a return to Lydden Hill Race Circuit in Kent. 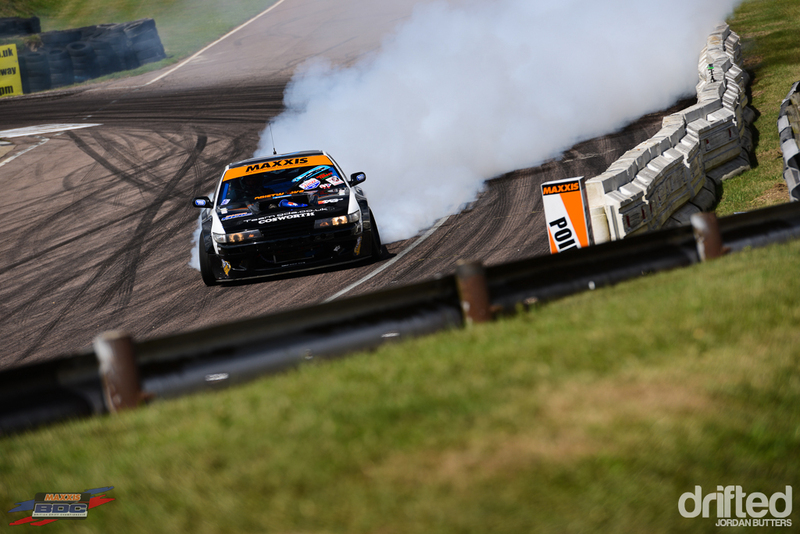 Although a hugely popular circuit with the drivers and spectators alike, this would be the second time the championship paid a visit to the curves and slopes of Lydden this year, so a change was deemed necessary to keep things fresh. As per previous rounds of the championship, a guest judge was brought in to help resident judges Rich Newton and Sid Crowfoot separate the wheat from the chaff. 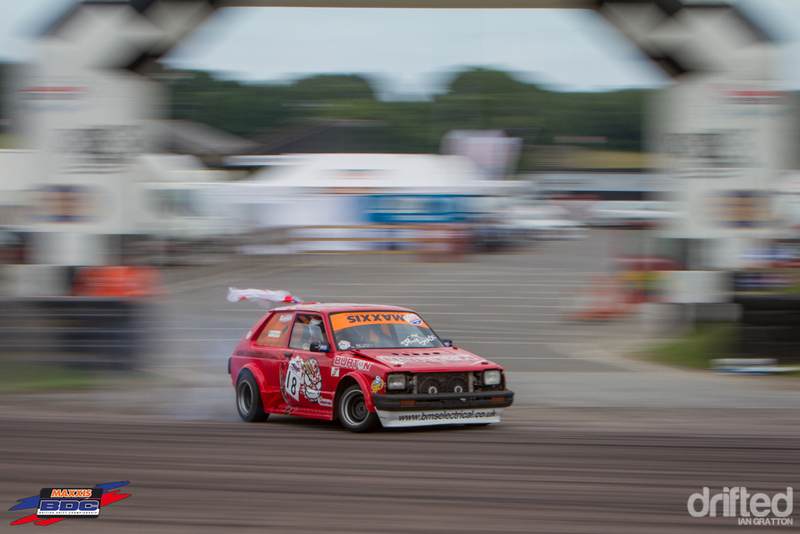 This time with would be the watchful eye of Irish Drift Championship judge Kieran Hynes, who not only brought with him experience but also a new idea, in the form of clipping boxes. 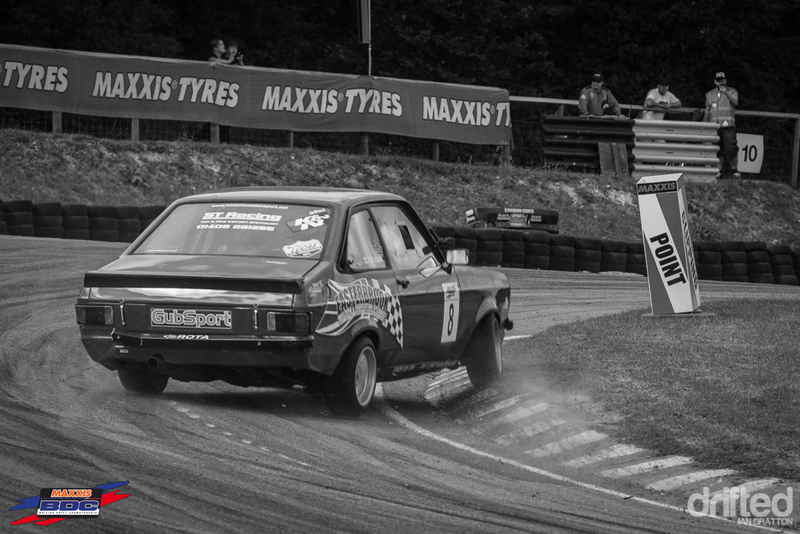 Traditionally driver skill has been measured by the way of clipping cones, placed just off the track – the idea being that the driver strives to place their front or rear bumper as close to the clipping point as possible, without clouting it into the next postcode. 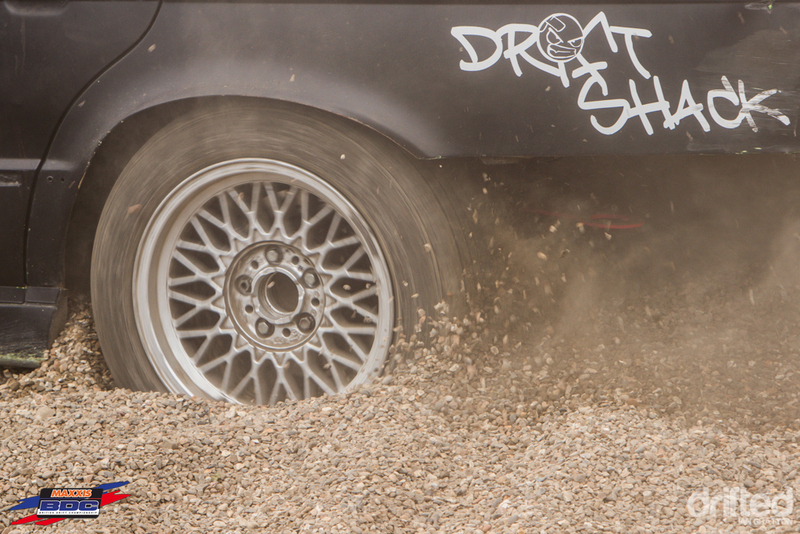 In reality, this usually results in the inevitable dirt-dropping carnage seen at previous rounds, as those cars with short bumper overhangs need to drag their wheels right at the edge of the tarmac in order to gain the proximity afforded to those with longer overhangs. There’s also bound to be the odd accident, with drivers overshooting the mark, of course. 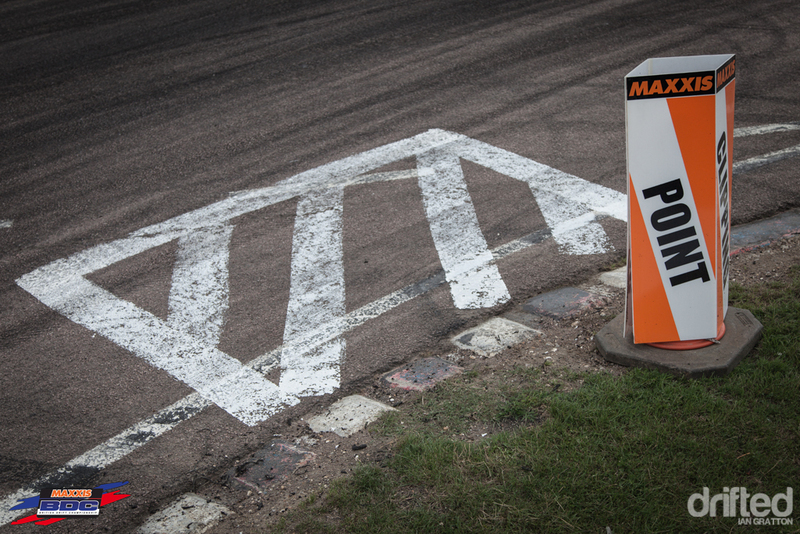 As much as we love to see this and it does look pretty cool, circuit staff and organisers are less keen, as repeat offences cause the creation of nasty lips and edges and the edges of the tarmac. 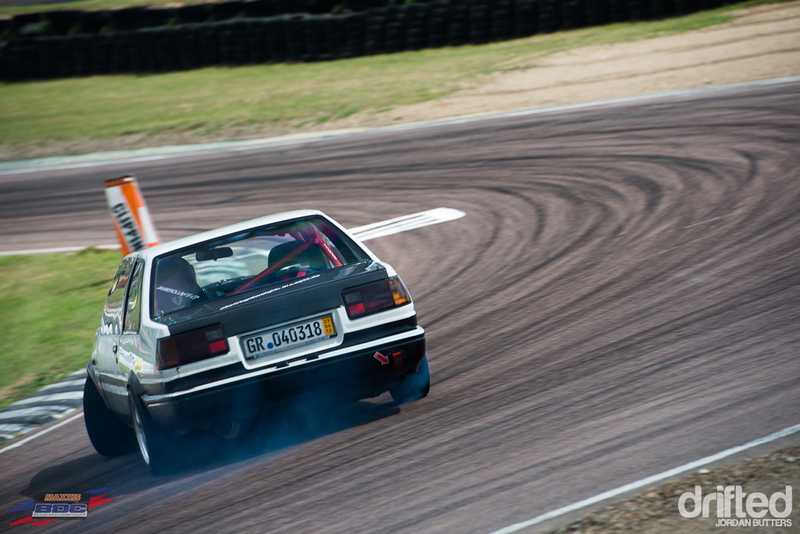 Upon arrival at Lydden this time around, the first noticeable difference was the painted clipping boxes that had been drawn on the track next to the traditional clipping points. The drivers were instructed that they should place as much of their car within these boxes as they pass through them, at as high an angle as they could. 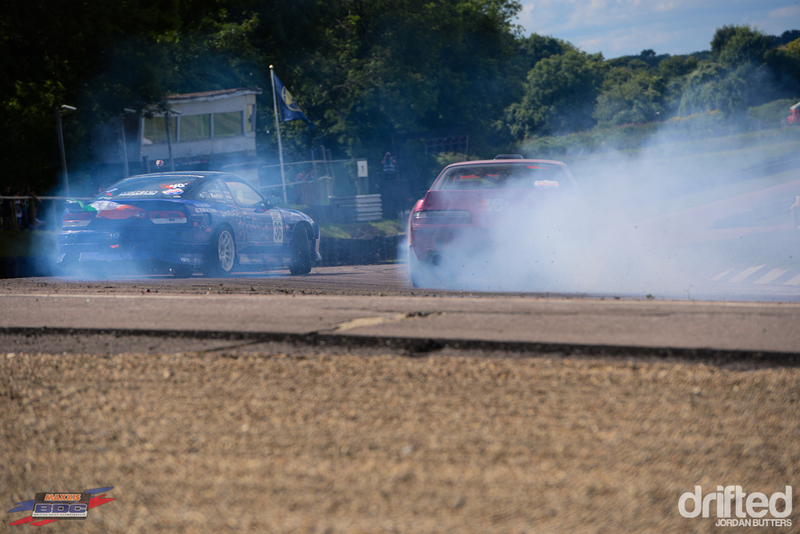 It made a huge difference to how the drivers directed their cars around the course, and made the judges’ task during qualifying far more straight-cut. 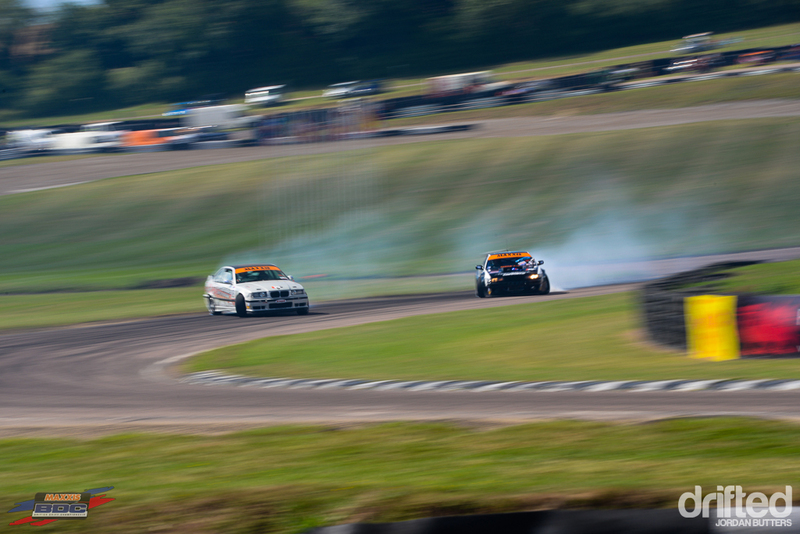 That said, there was still the odd spill that Lydden is so famous for. 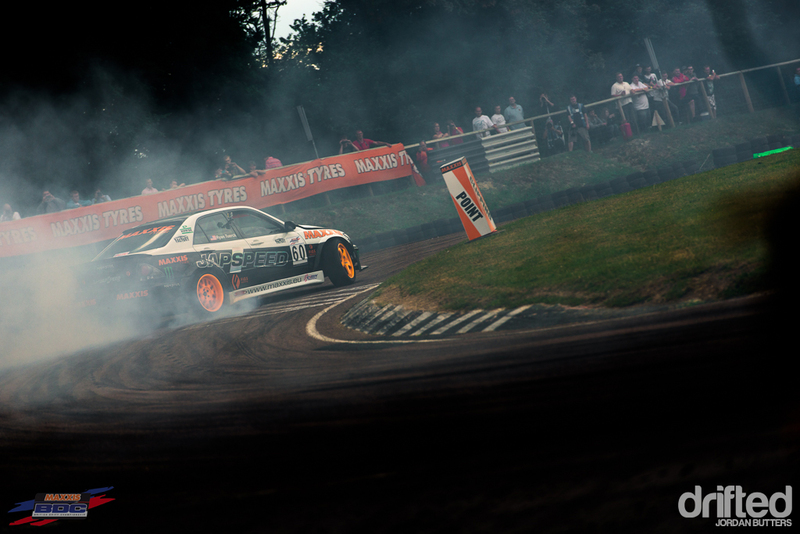 …touch a wheel in and the rest of the car gets sucked in deep. 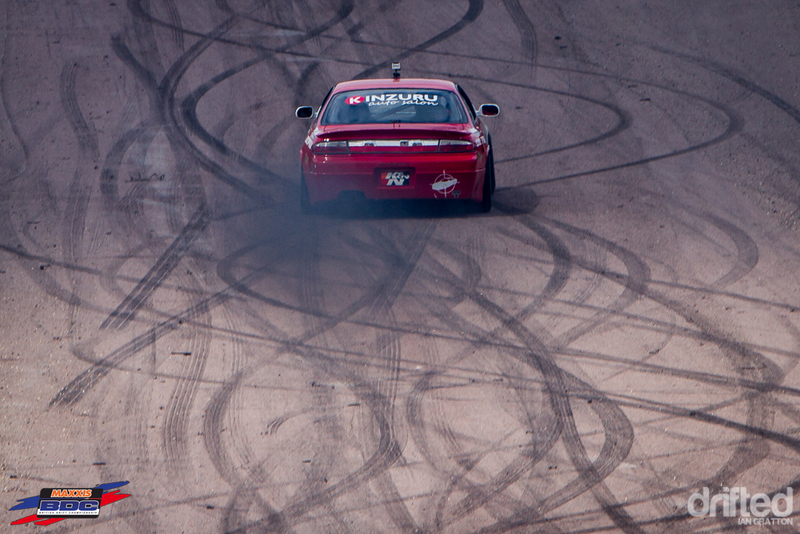 One of the unique traits in competition drifting is that a single venue or circuit can be used multiple times in a season, without necessarily running the same lines. 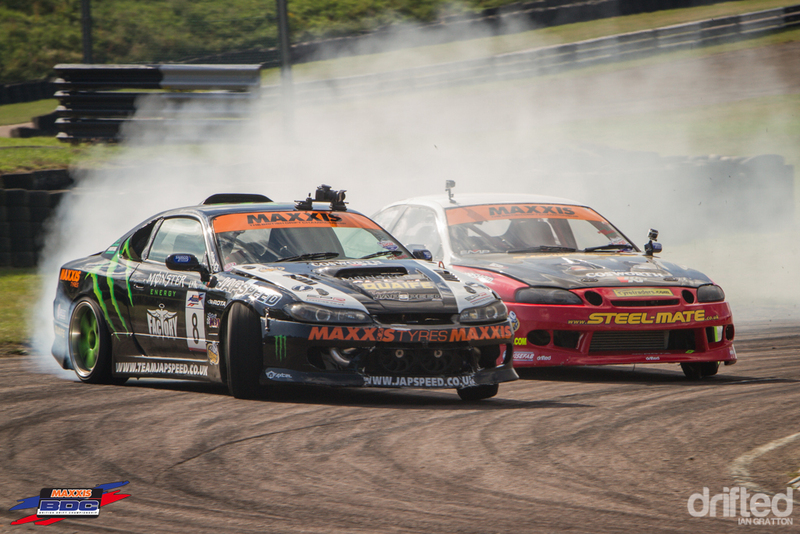 Different corners can be used, tracks can sometimes be run backwards, or as per at Lydden Hill, simply moving the position of the clipping points can force the drivers into taking completely different lines. This is enough to completely switch up the track and keeps things fresh. 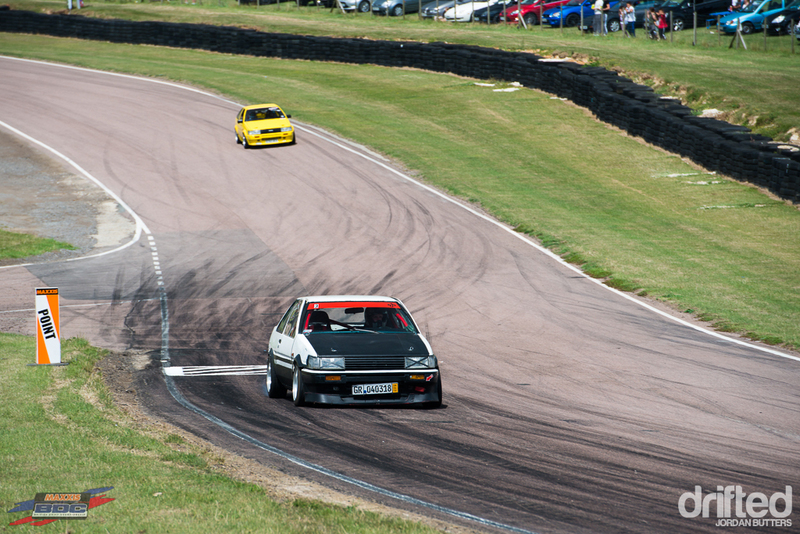 The other noticeable trait at Lydden is the track’s location within the local geography, the winding tarmac sitting at the base of a reasonable-sized bowl. 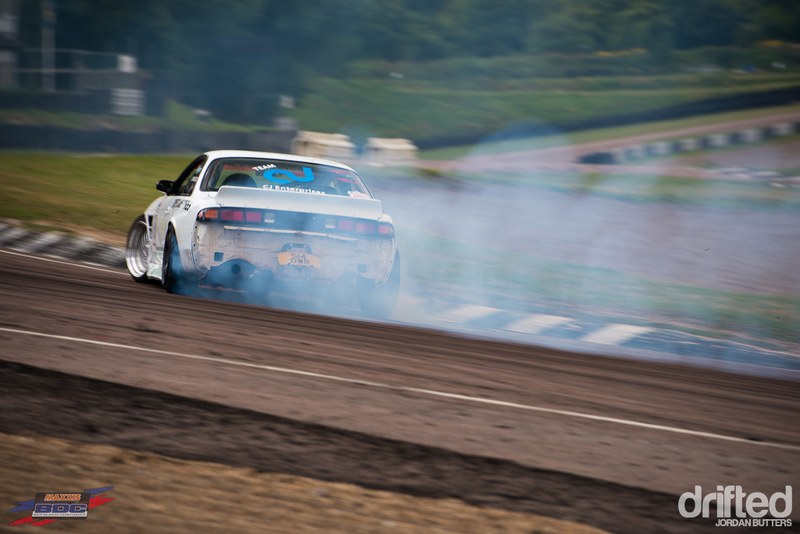 This makes for great views as a spectator, however the circuit has the habit of trapping smoke, especially so if there isn’t much wind on the day. This can be incredibly frustrating at times, especially for those of us posted track-side, making it hard to see and get clear shots of the cars at times. 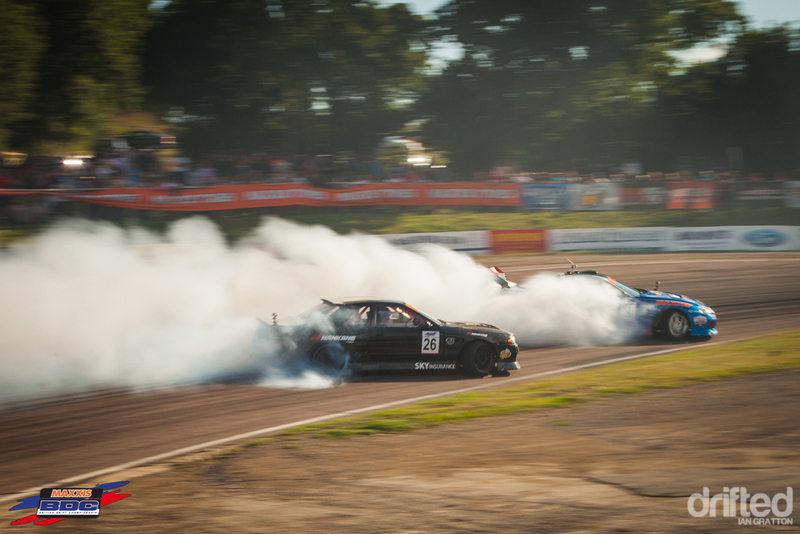 I can only imagine how tricky it must be for the drivers, drifting blind at high speed through a blanket of smoke, hoping that the driver in front of you in on their game. 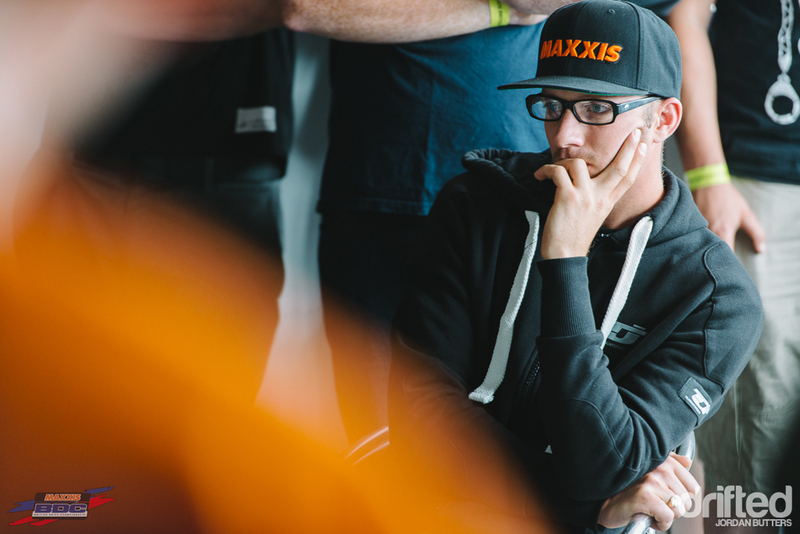 There’s a huge amount of trust involved, and even in the lowest Semi-Pro class at the BDC the driver ability has gotten noticeably better throughout the season. 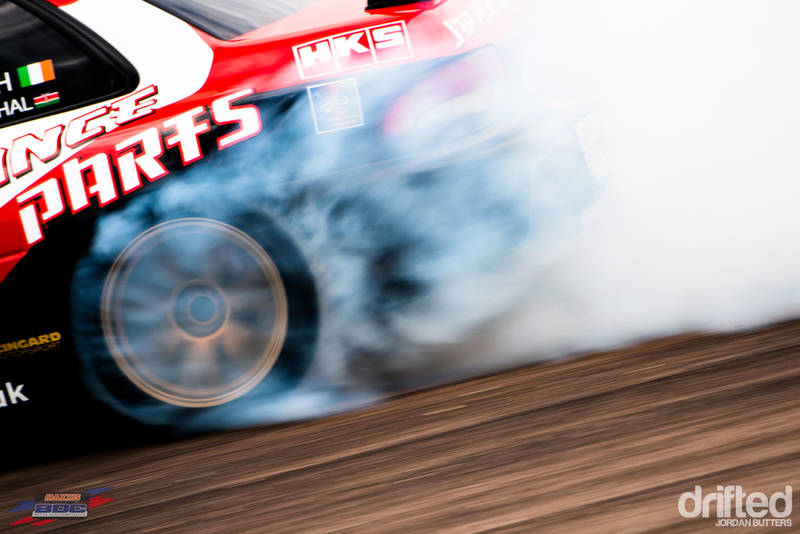 The big news for round four would be the inclusion of guest driver and Formula Drift star Ryan Tuerck in the roster. 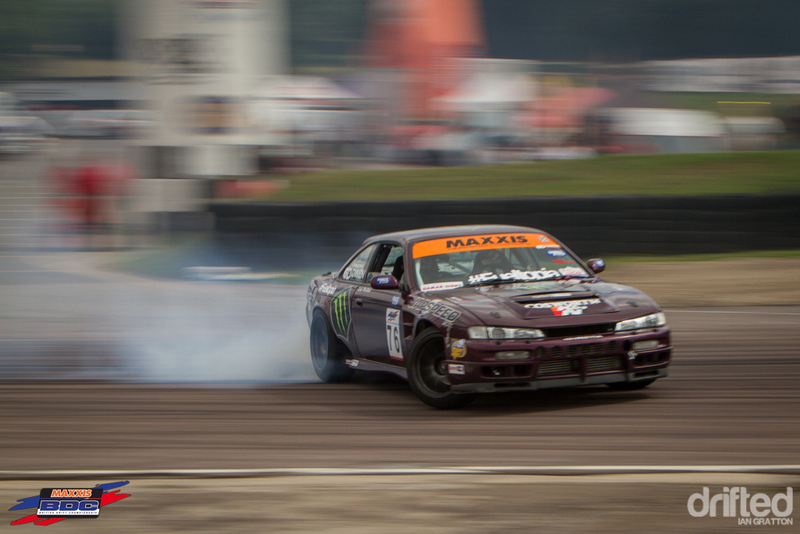 Ryan’s first time in the UK, he would be tasked with steering the Japspeed 2JZ Lexus in Sunday’s competition. …first repairing a driveshaft and then swapping out the differential. With practice in the bag for the rest of the roster, it was time for qualifying to get underway. 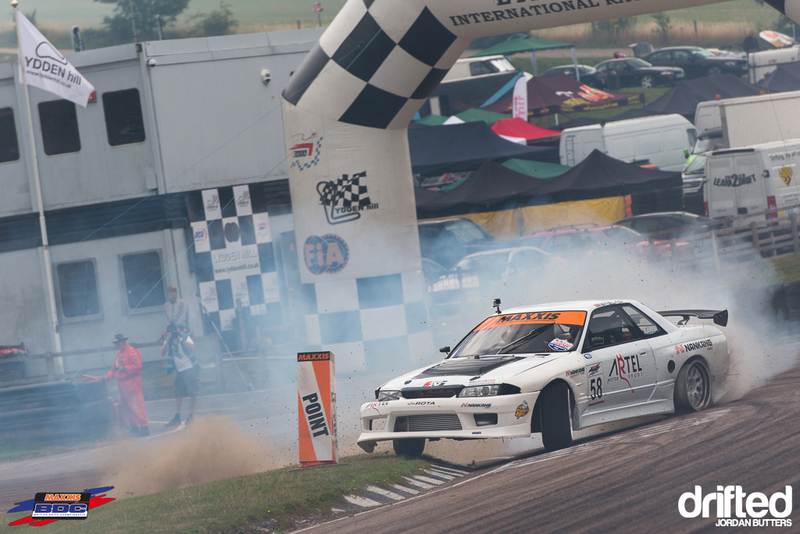 First up was the Semi Pro class, a solid set of runs from Chris Hakwer in his S14 saw him net third qualifying position. 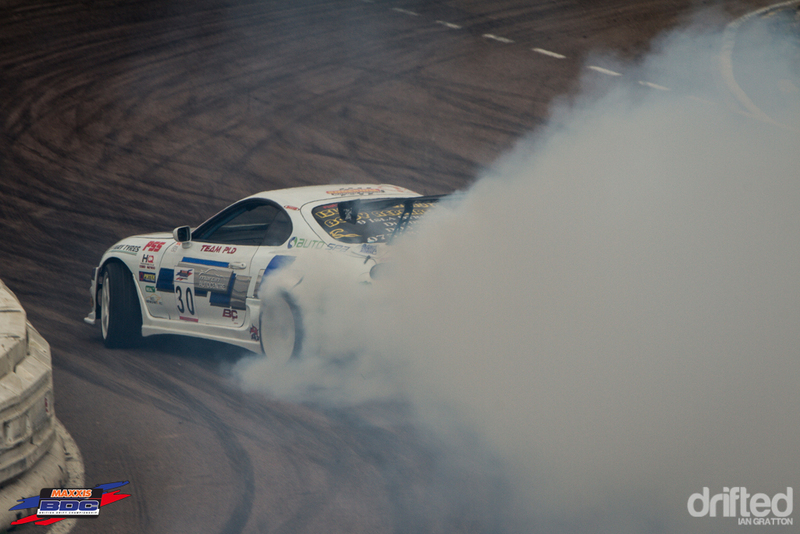 Second was secured by Marcin Mucha in his smoke-machine Toyota Supra. 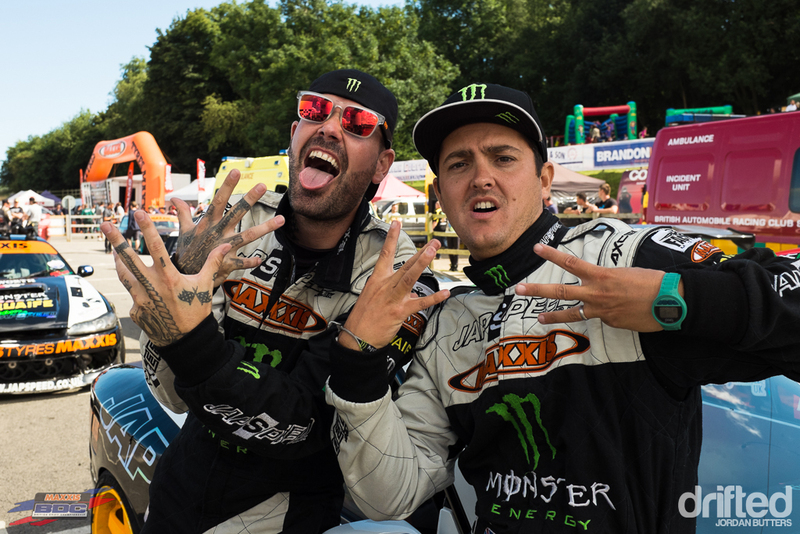 And first place was awarded to Monster Energy driver Luke Woodham, following a super-consistent and aggressive set of runs. 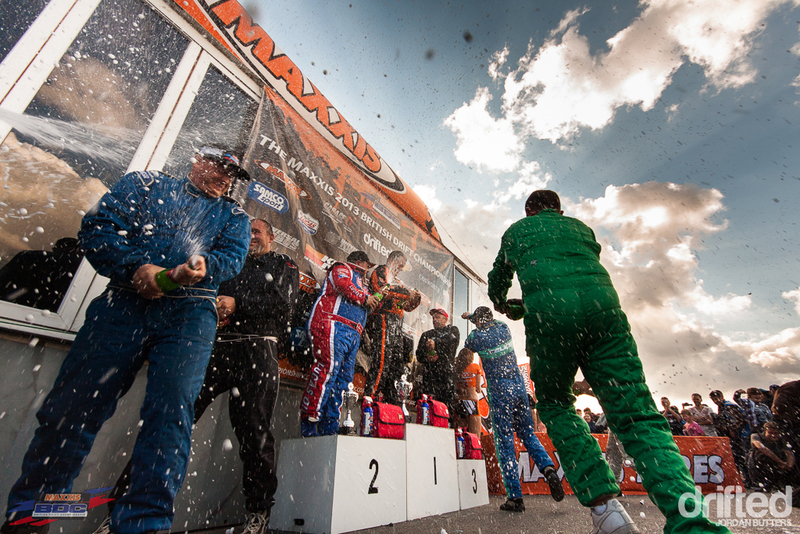 …while fellow GDA team mate Matt Tilyard took the honours for second place. 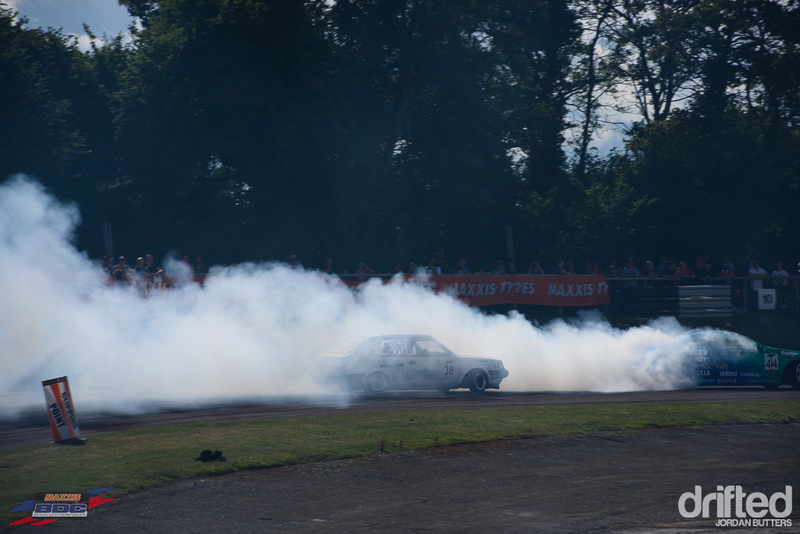 The primary position was filled by Dan Firmanger in the crowd-favourite 1UZ-powered V8 Volvo. 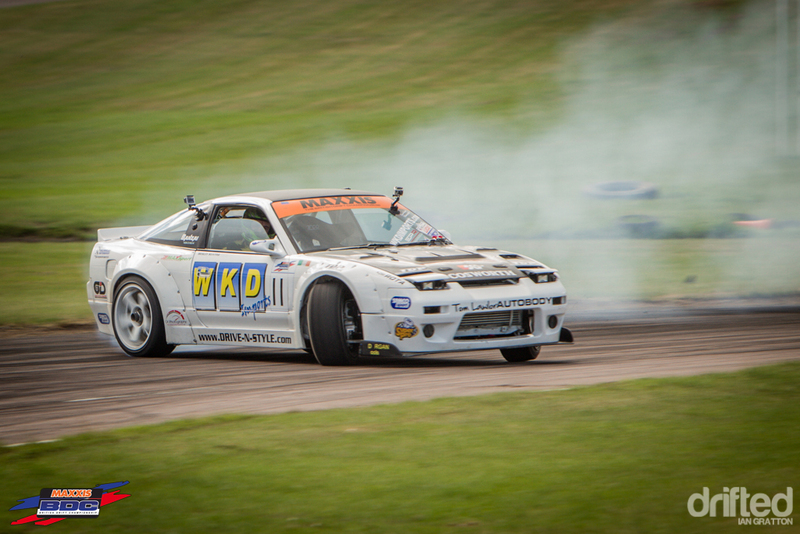 In the top-flight Super Pro class, Driftworks’ Phil Morrison piloted the 1JZ-powered DWR32 into third spot with flawless precision. 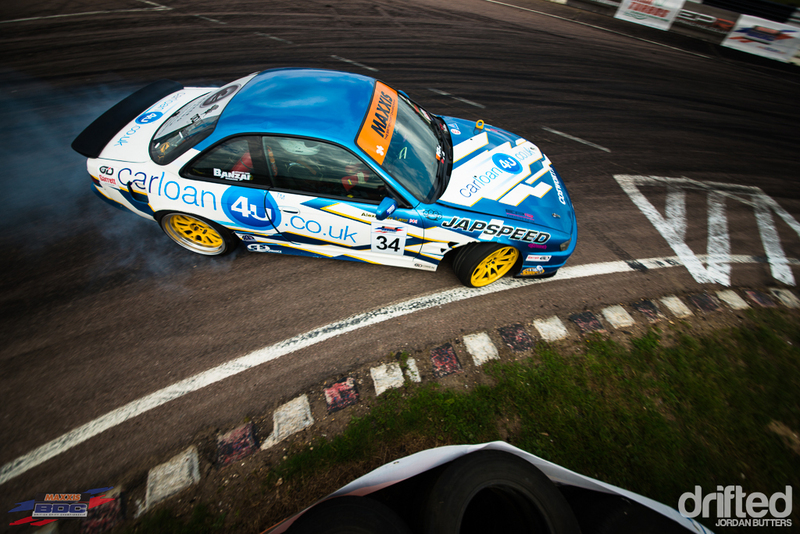 Walton Smith, a regular at Lydden Hill, steered the Jap Performance Parts GC8 Subaru into second position. 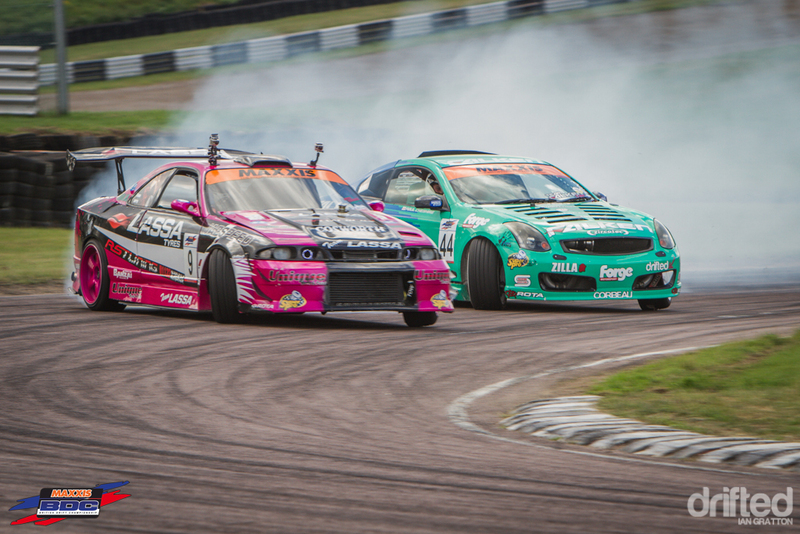 And Lassa Tyres’ Simon Perry claimed top spot, pushing his bright pink R33 to claim the top spot. 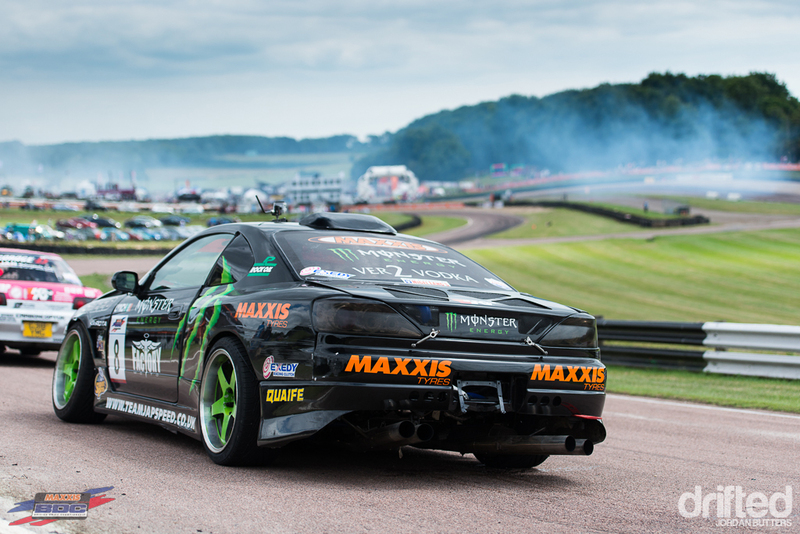 All eyes were also on Ryan Tuerck, who managed to secure 11th position, despite relatively little practice time in the Japspeed 2JZ Lexus. The relief on his face clear to see upon hearing the news! Main event day opened to the sound of 4AGEs rasping around the surrounding countryside. 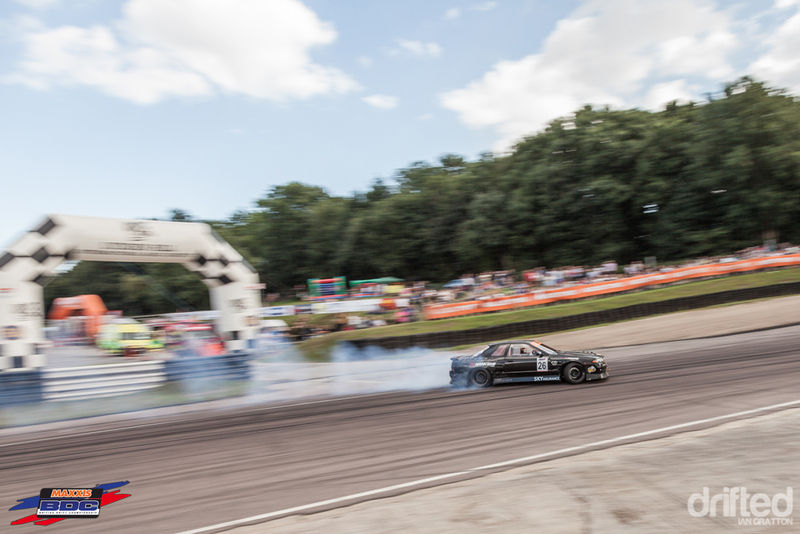 The Corolla Brotherhood’s annual gathering was due to take place at Lydden Hill, coinciding with the main BDC event on the Sunday. 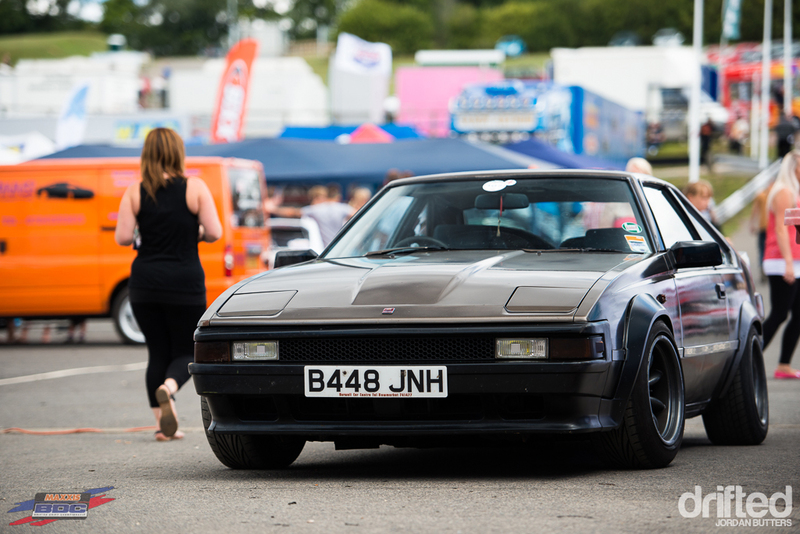 I say ‘due’, as although there were a smattering of retro Toyotas present, the turnout was disappointing. 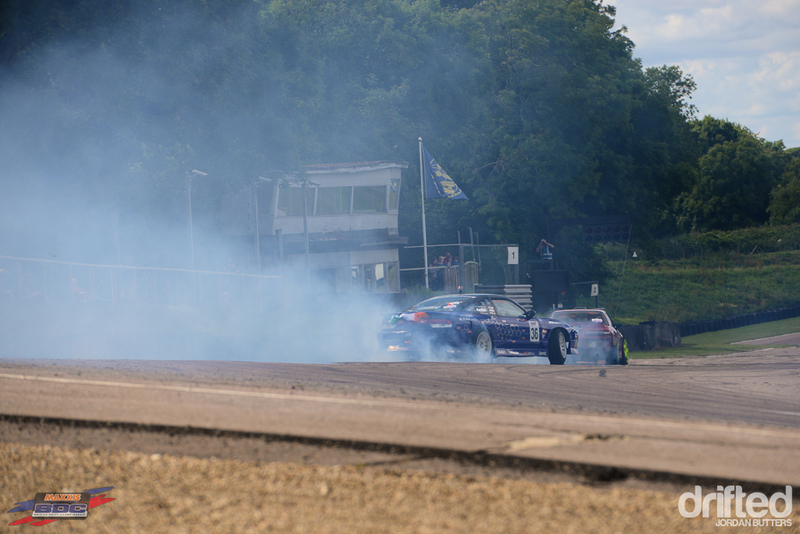 Which is a shame as I was looking froward to seeing the Kent circuit filled with those raspy little Toyotas everyone has a soft spot for. 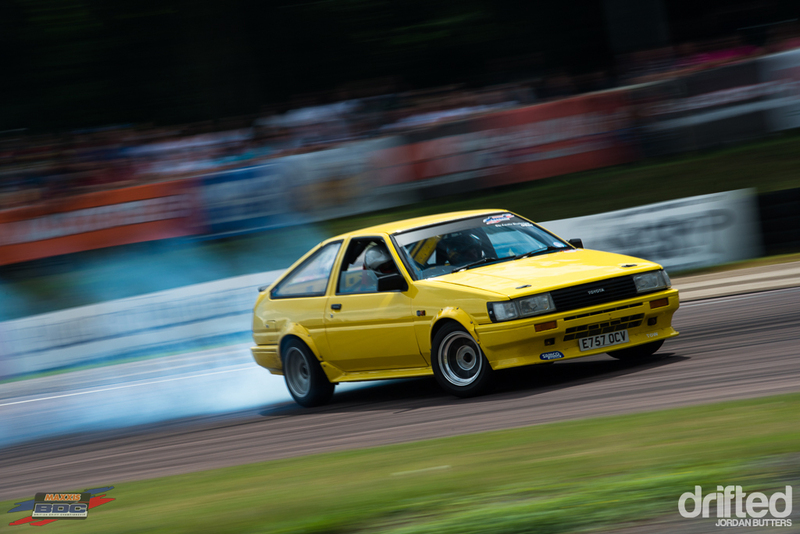 Still, quality over quantity – BDC organiser Mark Buckle got the chance to take his yellow peril out on track, and showed the BDC competitors that he still knows how to peddle a car. 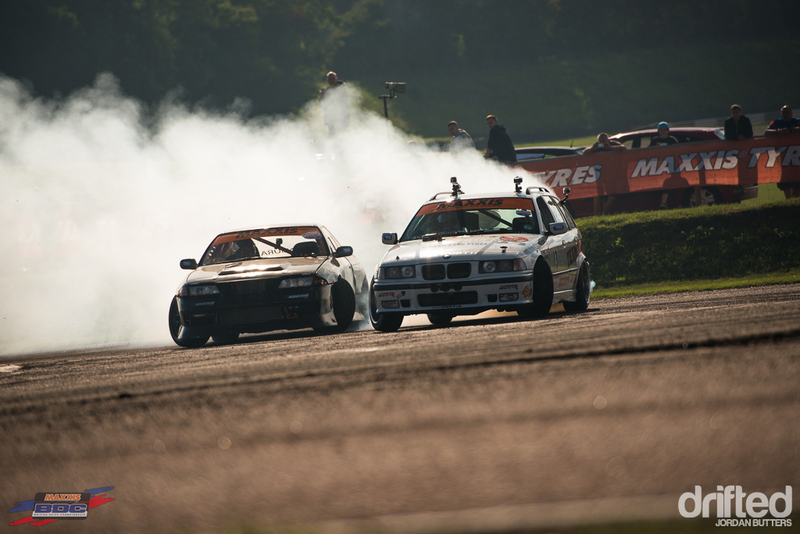 It was soon time for the main event, with the Semi Pro class kicking off proceedings first. 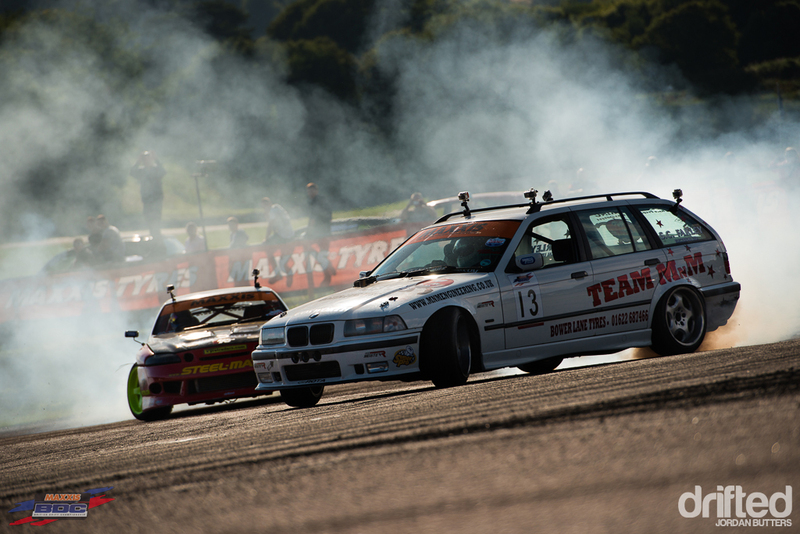 …but the mighty BMW of Jankowiak out-drove Hawker to claim the lowest podium tier. 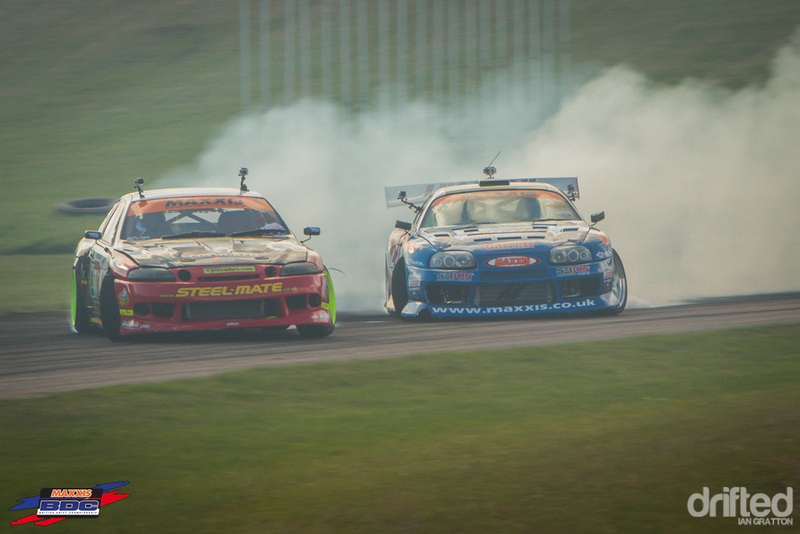 Marcin Mucha in the Toyota Supra and Matt Samuel in the Car Loan 4U 300zx would go head-to-head in the final. Samuel’s high angle into the first corner serving him well, however a miscalculation would see him drag the front of his car across the grass, handing the win to Mucha. 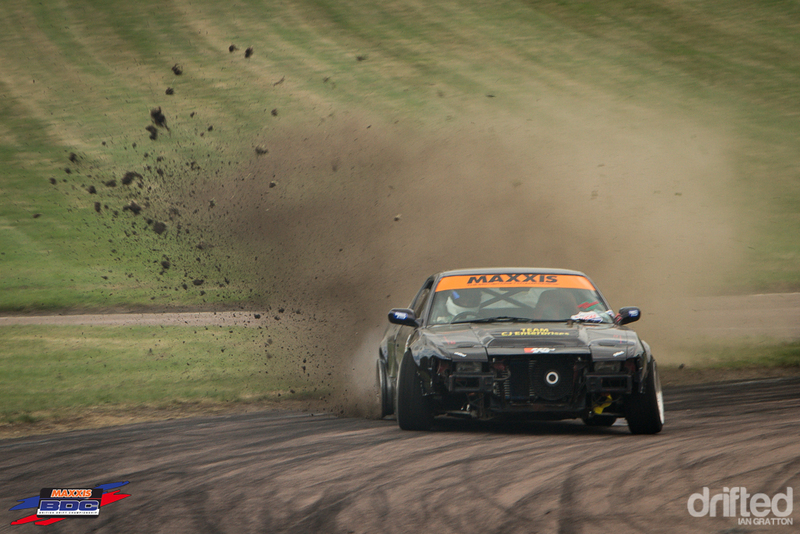 In the Pro class some drivers were noticeably on form from the get go. 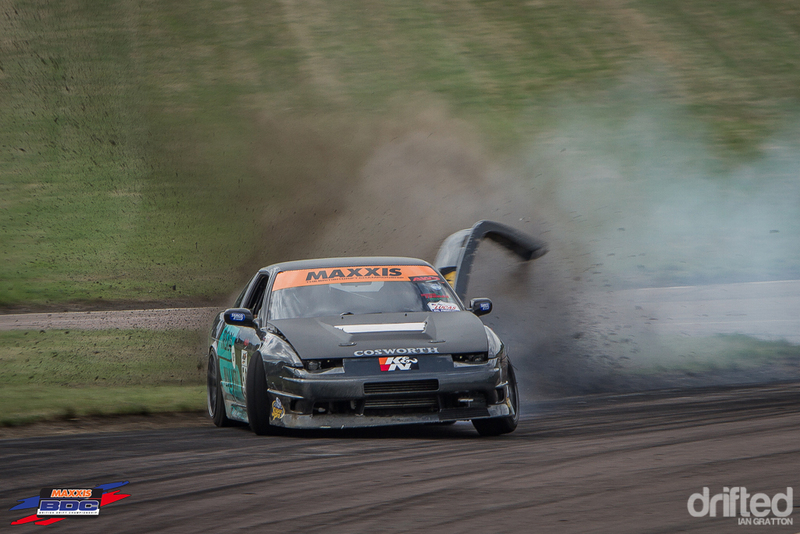 Jay Green always drives well at Lydden, having won the first round of the 2013 championship here. 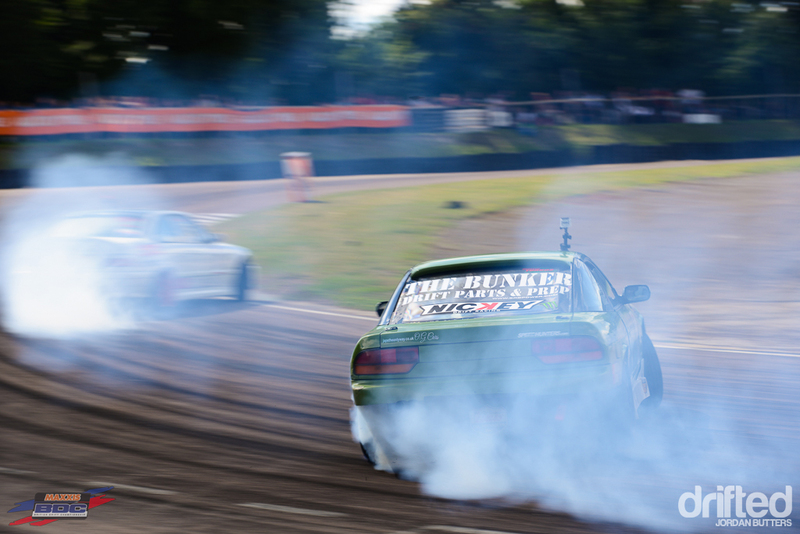 Nathan Chivers was on point too, the sound of his LS-powered S13 is truly amazing, as is its ability to produce a ton of smoke. 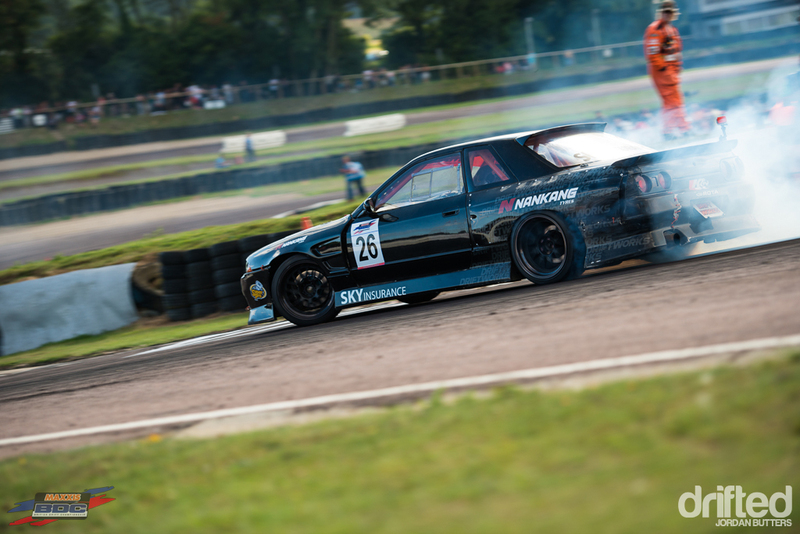 Speaking of smoke… no-one quite does it like Team Falken’s Paul Cheshire, who was on form following a 2nd place at the previous round at Teesside. 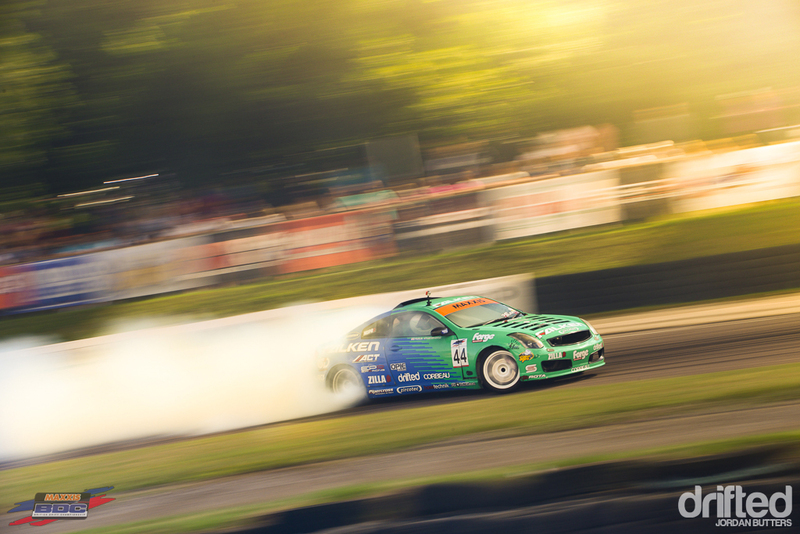 His 700bhp 2JZ-powered G35 decimating a set of Falken FK453’s every third run, making his a tricky contender to chase. 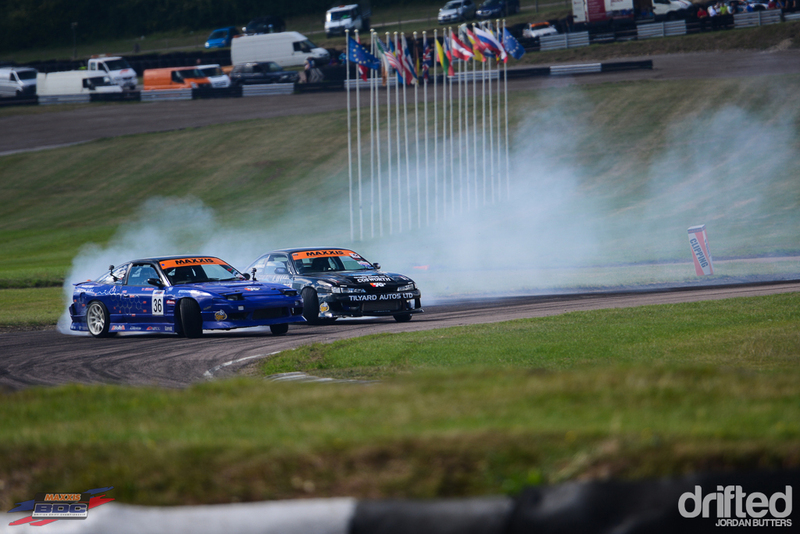 …before coming up against GDA’s Matt Tilyard who sent him packing. …a small error on the behalf of Chivers seeing Tilyard lofted into third place. 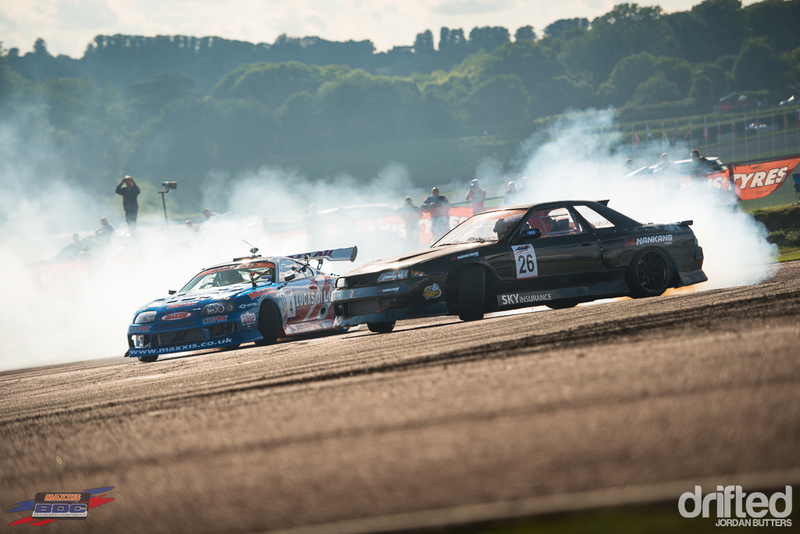 Pro championship leader Jay Green would come up against Paul Cheshire in the Pro finals. 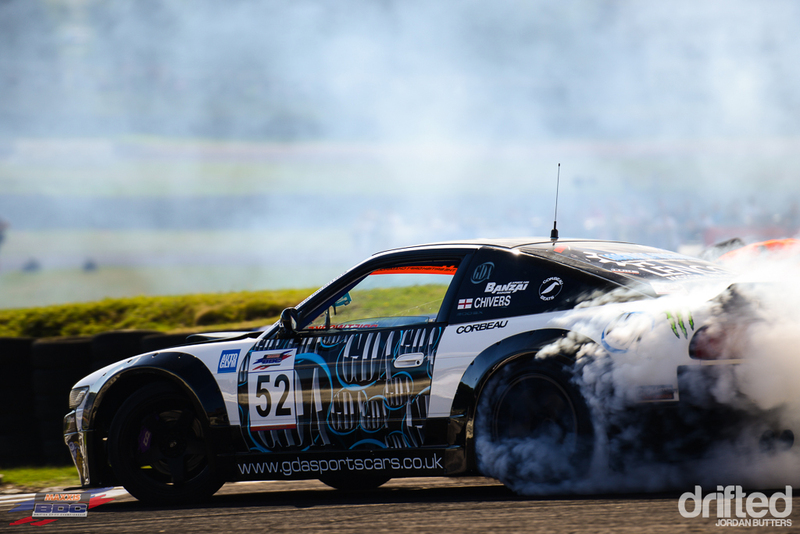 Green drove well, but was no match for the pace and smoke of Cheshire, handing him his first victory this season and putting him in championship contention for the final round. 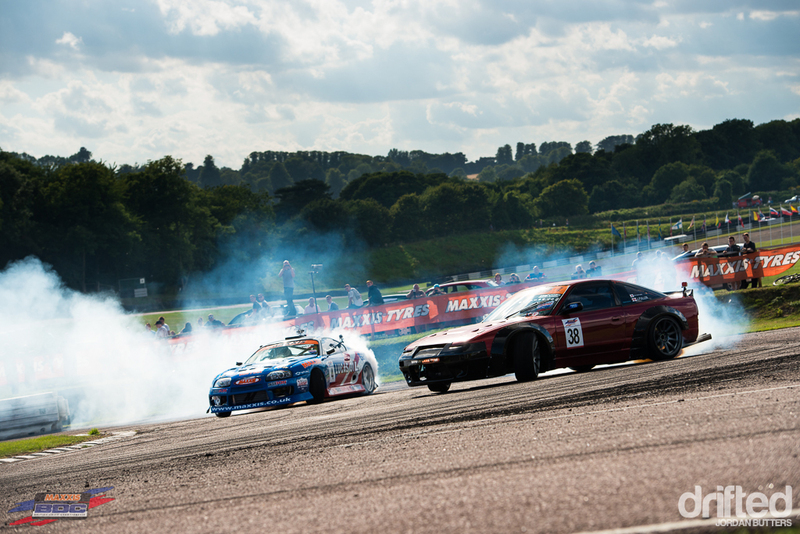 In the top-flight Super Pro class there were some surprises. 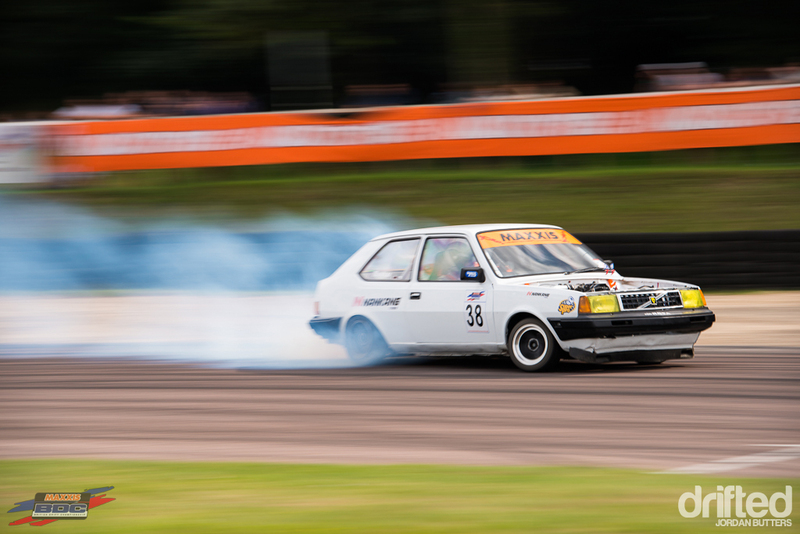 Stiggy in the super Starlet failed to qualify, leaving him noticeably absent on the Sunday. 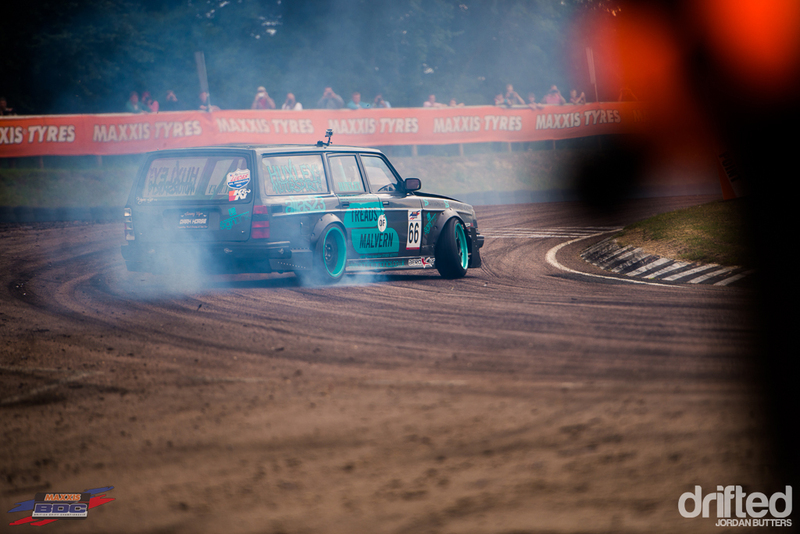 …and drivers were their usual cool, collected-selves. 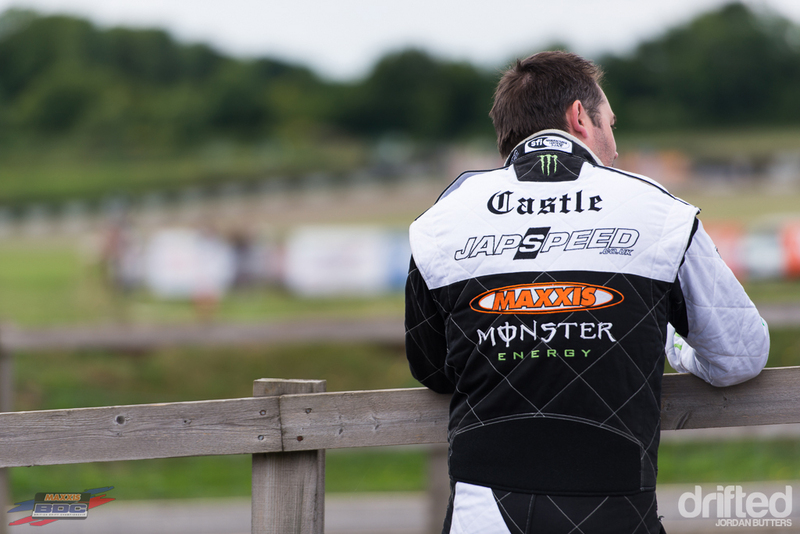 Team mate Brett Castle would also be forced to sit out the Top 16, after his Subaru developed terminal problems. 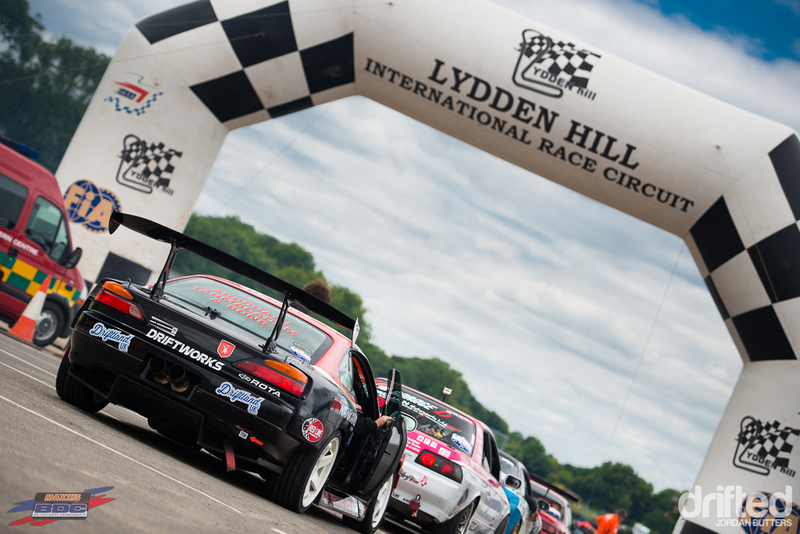 Shane Lynch would exit during the Top 16, losing out to Wayne Keeber in his Toyota Soarer. 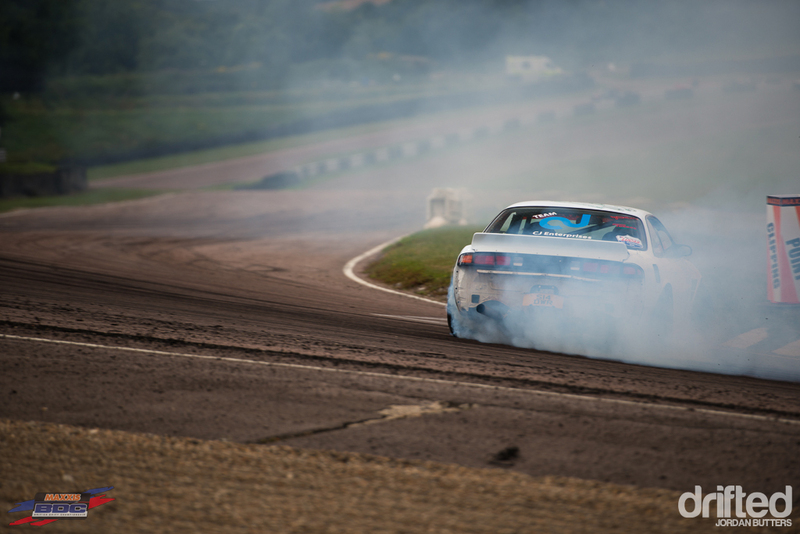 As would current champion Paul Smith, bowing out to David Waterworth’s Viper V10 power. 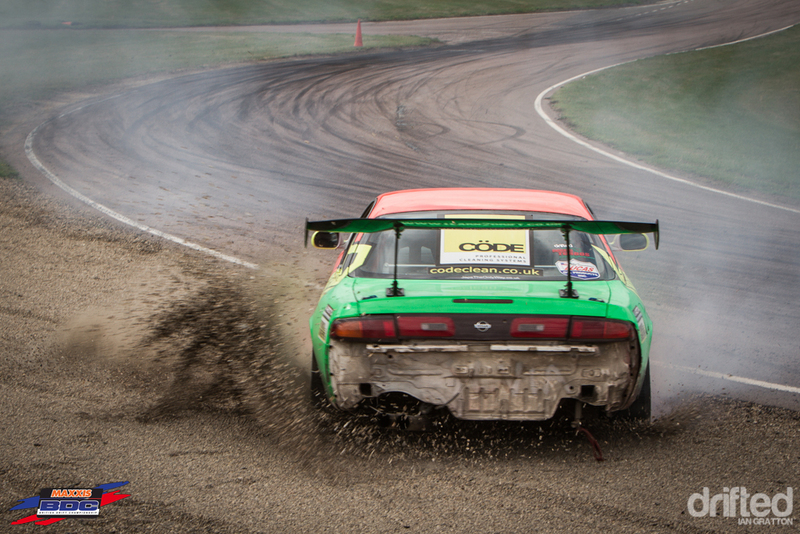 Waterworth would get as far as the Top 8 before Keeber did the deed and out drove Waterworth into the Semi Final. 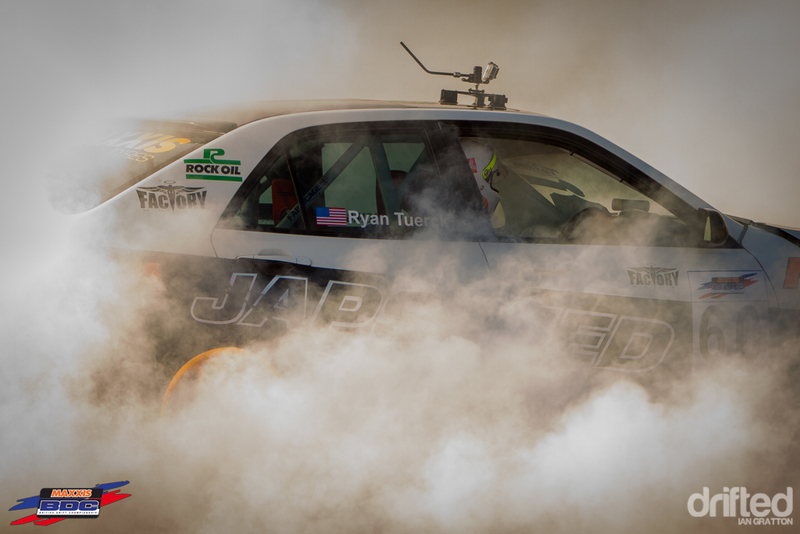 Ryan Tuerck was left flying the Japspeed banner, with very little seat time in a foreign car, he would face Wes Keating. 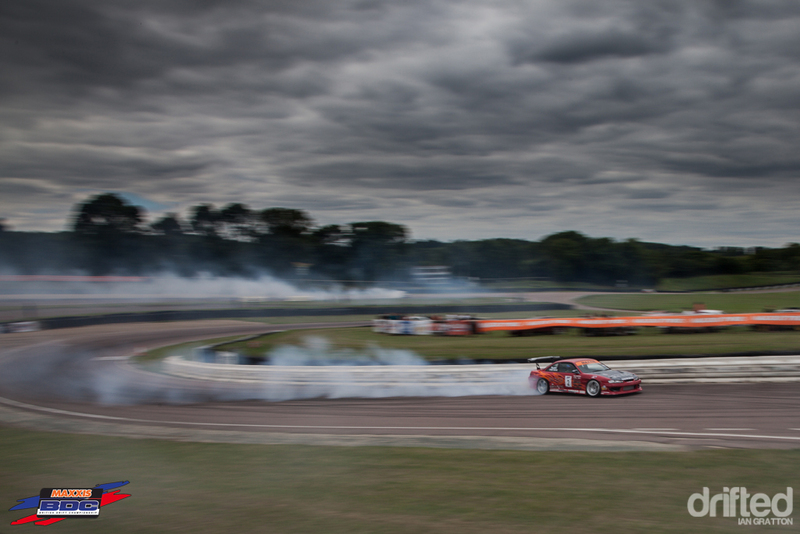 …enough to see Tuerck exit from the competition surprisingly early. 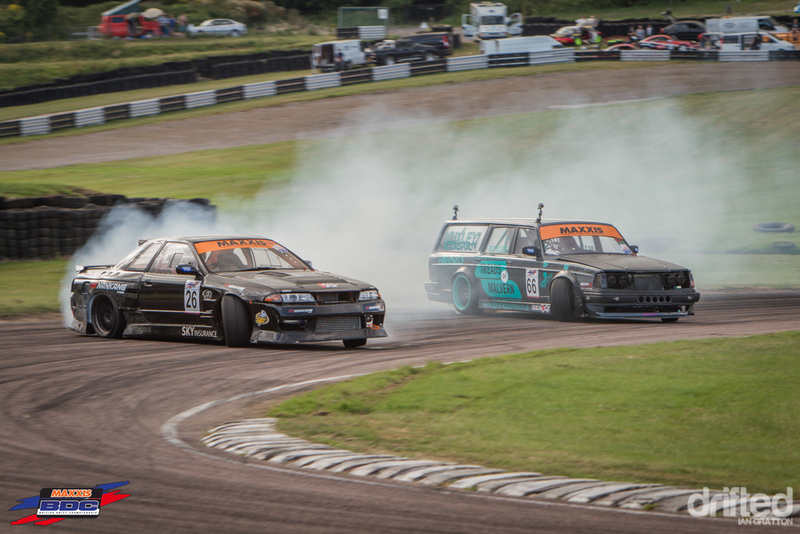 Keating would then meet Driftworks’ Phil Morrison who, after a close battle, dealt Keating the same fate, ending his run. 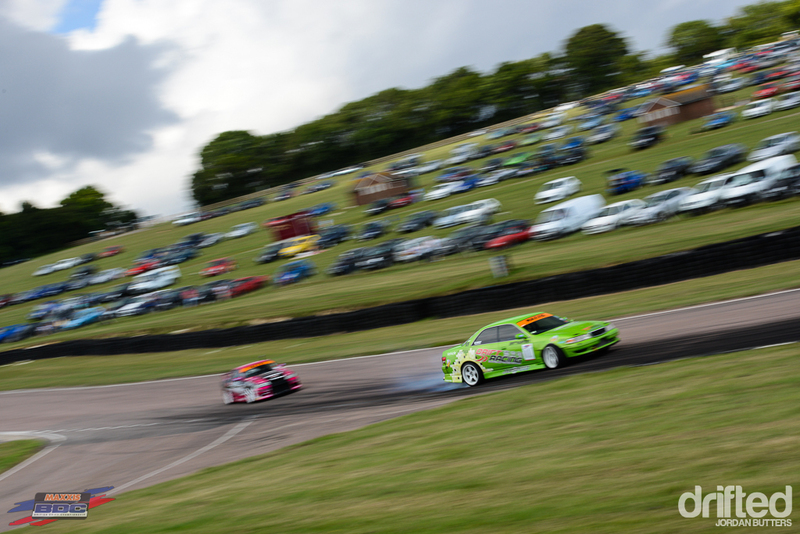 Following a good standing at round three, Falken’s Paul Cheshire was gifted the chance at qualification in the Super Pro class at Lydden, which he grasped with both hands, qualifying in 16th place. Putting him up against top qualifier Simon Perry. 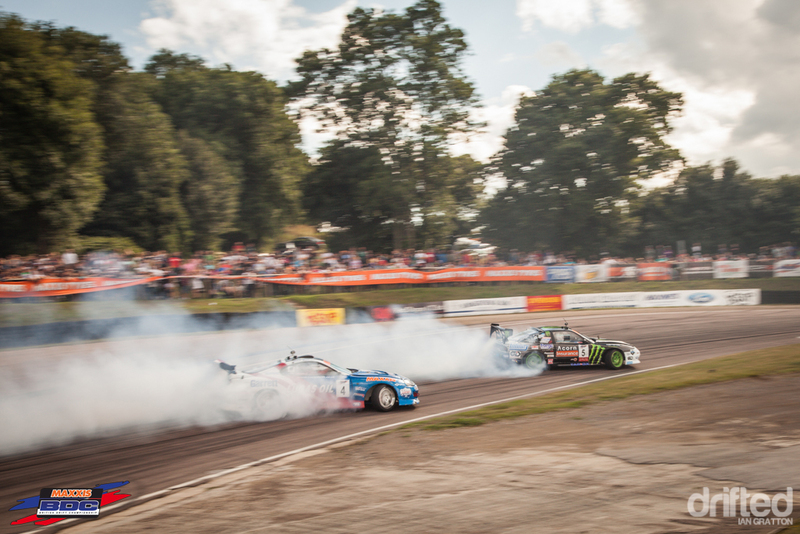 …fresh from his Pro class victory, Cheshire pushed hard to eliminate the Lassa Tyres driver. 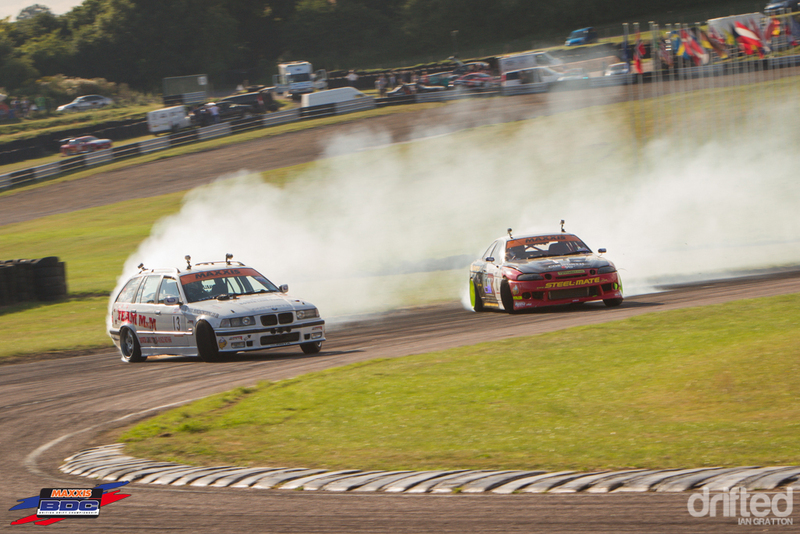 Cheshire would then face-off against the 2JZ E36 wagon of Michael Marshall, but would be unable to put in a repeat performance, Marshall proceeding on to the Semi Finals. 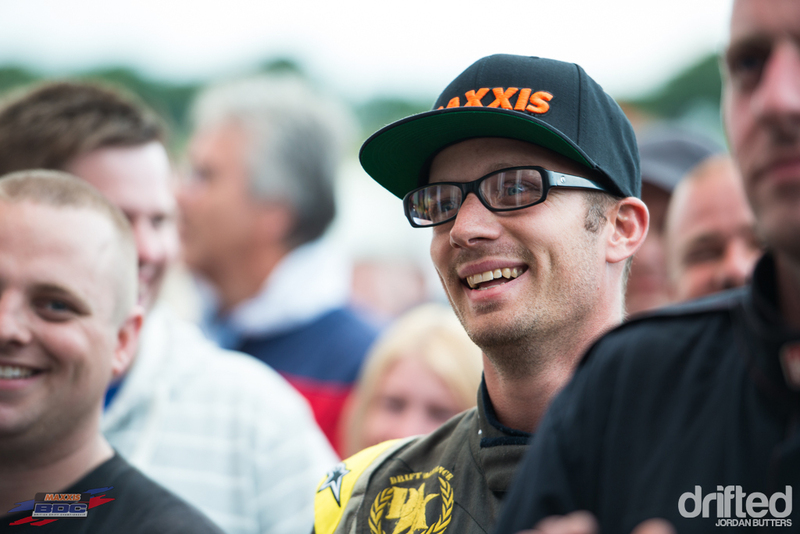 …and then James Fuller the same. To meet Wayne Keeber in the Semi Finals. 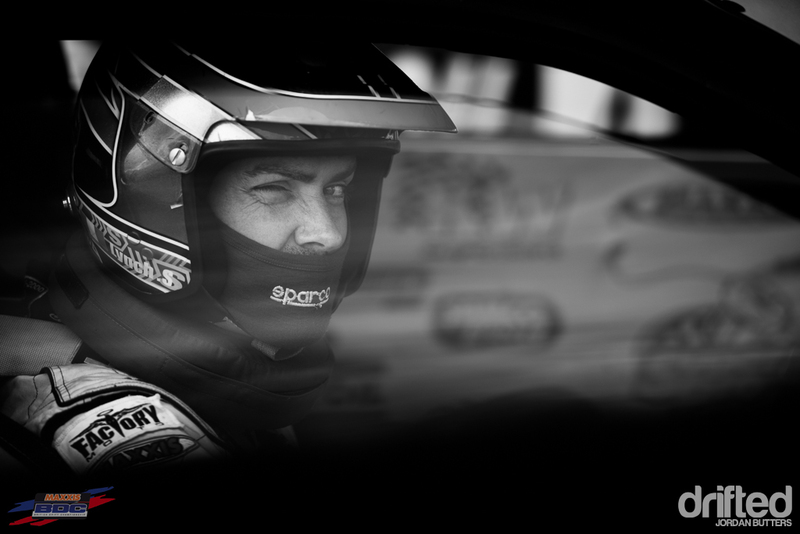 A very close battle between these two familiar drivers would see Luney progress into the Finals. His opponent would be a flying Phil Morrison, who had send packing Marc Huxley in the V8 Volvo of Doom in the Top 16. And Michael Marshall in the Semi Final. As the sun dropped below the tree line, it was time to decide on the podium standings, Keeber and Marshall lining up first. 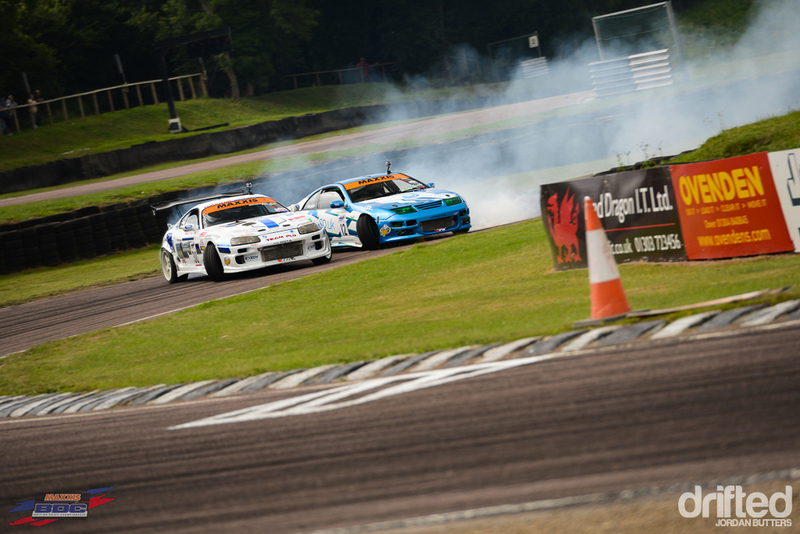 Keeber drove well, but Marshall drove better, putting pressure on Keeber and securing the 3rd podium tier. 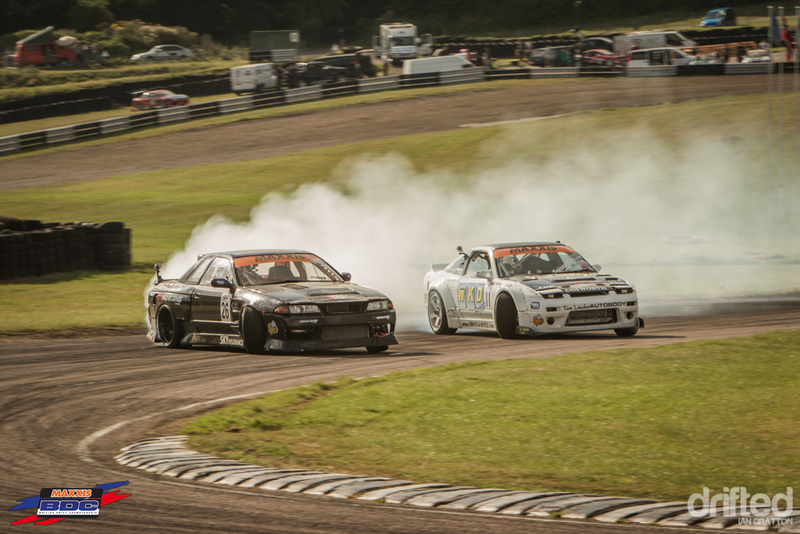 The Finals would be made up of two of UK drifting’s longest-standing patrons – Phil Morrison vs Mark Luney. 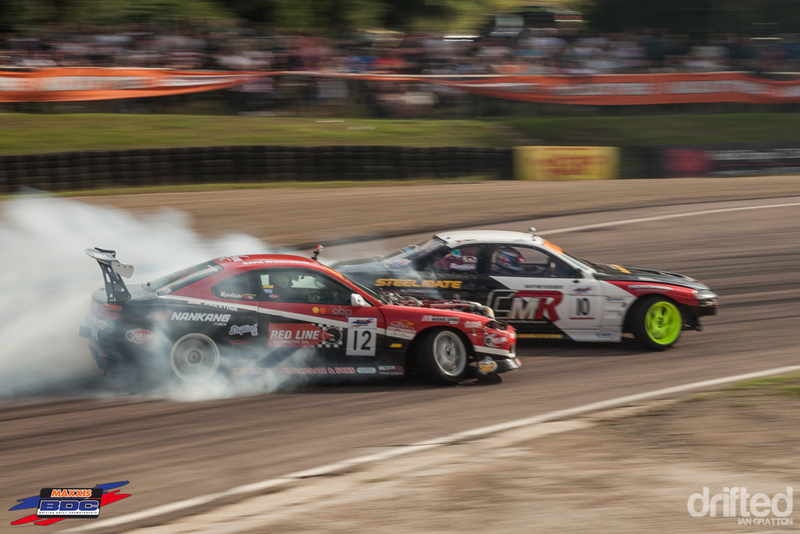 It’s a battle that I’m sure we’ve seen countless times before, both of these drivers being involved in competitive drifting in this country since day one. 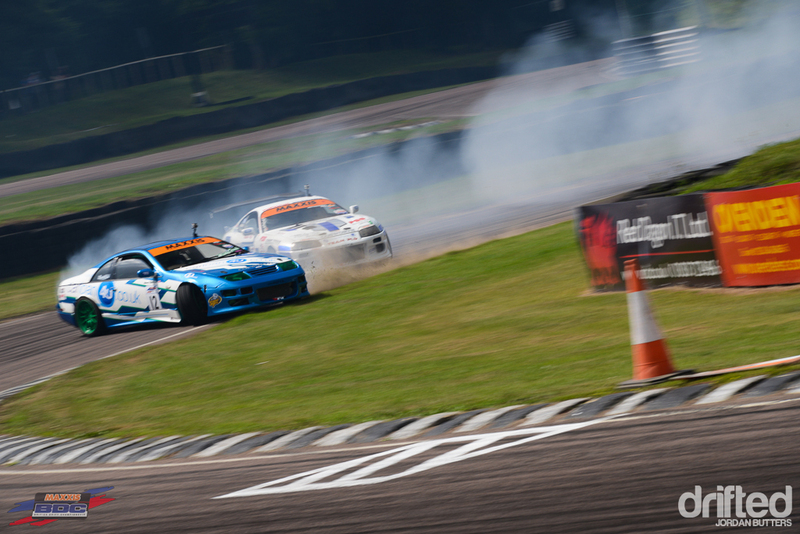 As the battle unfolded it was unclear to those of us track-side as to who took the win, both drivers putting in solid runs. 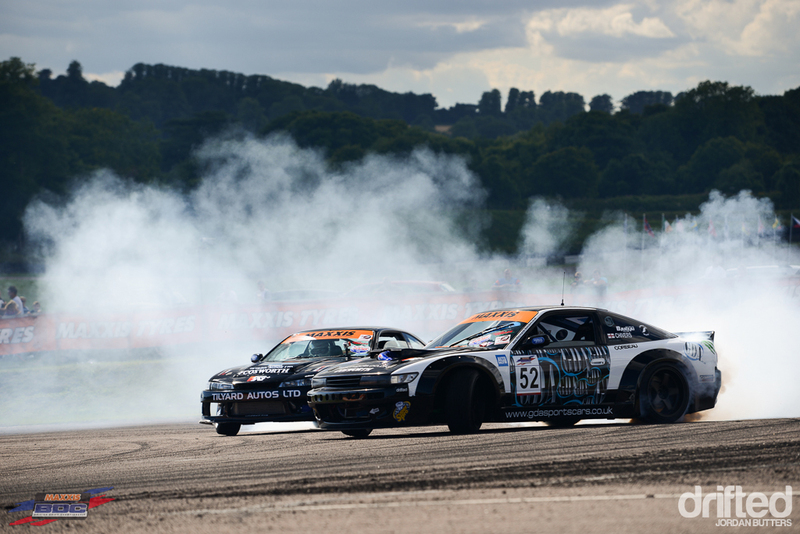 After the smoke settled, the judges had a decision… it would be Phil Morrison who would lift the trophy at round four of the Maxxis British Drift Championship. 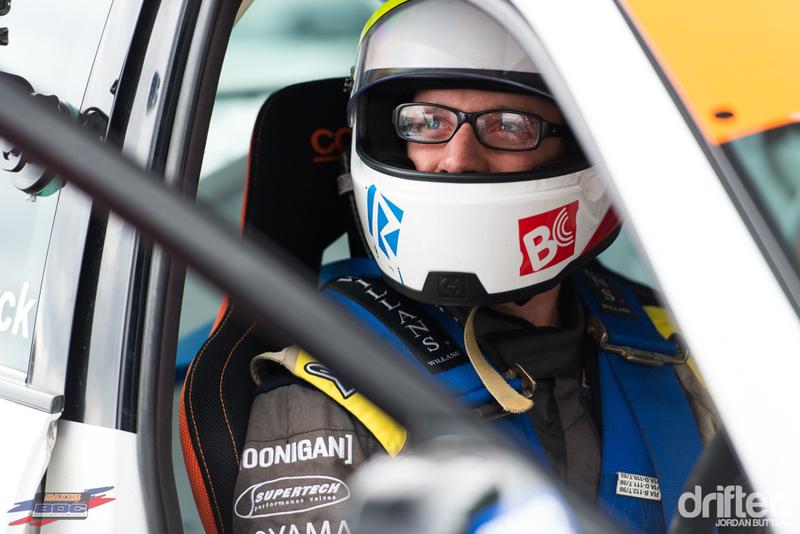 Although Mark Luney now sits in first place in the championship standings, this season has provided a different winner at every round, meaning that the championship is wide open going into the final round at Knockhill Circuit, Fife, Scotland on 21-22nd September.